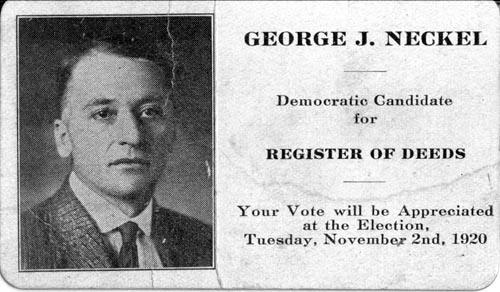 George J. Neckel, Democratic Candidate for Register of Deeds. Your Vote will be Appreciated at the Election, Tuesday, November 2nd, 1920. Are you looking for NECKEL ancestors? If so, we suggest posting a query to our Community Message Board to get assistance from other researchers.